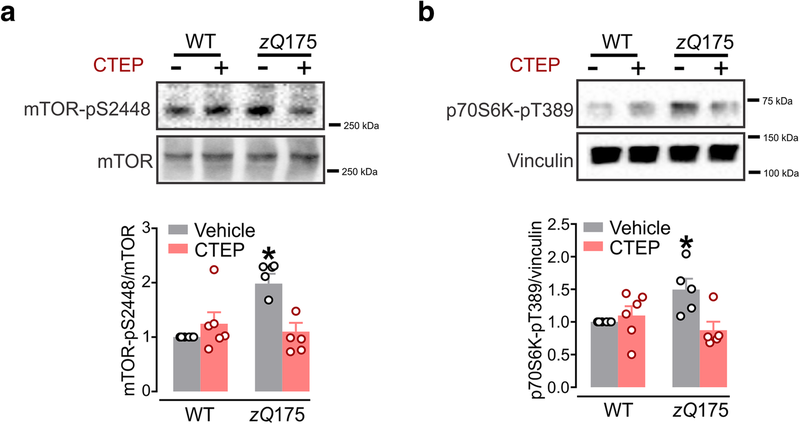 The favorable outcomes of mGluR5 blockade in the zQ175 model of HD and both the APPswe/PS1ΔE9 and 3xTg-AD models of Alzheimer’s disease were associated with increased autophagy via alterations in Zinc finger and BTB domain-containing protein 16 (ZBTB16)- and Unc-51-like kinase 1 (ULK1)-dependent mechanisms [10, 13]. Specifically, we showed that mGluR5 inhibition in zQ175 reduced ubiquitin-mediated degradation of the autophagy adaptor ATG14 via GSK3β-dependent inhibition of ZBTB16-Cullin3-Roc1 E3-ubiquitin ligase complex. Interestingly, CTEP also reduced the inhibitory phosphorylation of ULK1 at S757 that was paralleled by enhanced phosphorylation of the autophagy factor ATG13, required for autophagosome formation [10, 14]. Although the activation of ULK1 is key for autophagy initiation, the molecular cascade that is required to transduce the mGluR5 signaling to ULK1 remains poorly-defined . A reduction in neuronal apoptosis and rescue of neurons when stained for neuronal nuclei (NeuN) in CTEP-treated zQ175 mice was also observed . Since mHTT is known to alter transcriptional regulation and apoptosis [16–18], it remains unclear whether the autophagic clearance of mHTT following chronic mGuR5 inhibition can reduce the loss of striatal neurons and nurture the neurotrophic capacity in HD brains. A critical step in autophagy is the formation of the autophagosome and this step is primarily regulated by ULK1 . Phosphorylation of ULK1 at S757 site by the mTOR complex results in suppression of its catalytic activity and inhibition of autophagy [15, 19]. We have previously reported that chronic inhibition of mGluR5 reduces the inhibitory phosphorylation of ULK1 at S757 site to induce autophagy . Here, we tested whether mTOR activity was elevated in homozygous zQ175 mice that might explain reduced ULK1 activity and autophagy inhibition and whether mTOR activity can be modulated by CTEP. The phosphorylation of mTOR at S2448 has been demonstrated to represent the activation state of the PI3K pathway, in addition to serving as a biomarker for the activation status of mTOR [19–22]. Thus, we first examined changes in mTOR-pS2448 phosphorylation status in homozygous zQ175 huntingtin knock-in wildtype (WT) mice following a 12-week treatment with either vehicle or CTEP (2 mg/kg) at 12-months of old age. Brain lysates derived from vehicle-treated homozygous zQ175 mice showed a significant increase in mTOR-pS2448 phosphorylation compared with WT mice (Fig. 1a). Interestingly, the increase in mTOR-pS2448 phosphorylation was reversed in CTEP-treated homozygous zQ175 mice to values indistinguishable from WT. To further confirm that the changes in mTOR-S2448 phosphorylation reflected changes in mTOR signaling, we measured phosphorylation of the mTOR downstream ribosomal protein S6 kinase (p70S6K1). mTOR has been shown to regulate the protein translational machinery at synapses by modulating p70S6K1 activity through the direct phosphorylation at T389 and this phosphorylation has been considered to be a hallmark of mTOR activity [20, 23, 24]. Similar to mTOR-pS2448 phosphorylation, we detected higher levels of p70S6K1-pT389 phosphorylation in vehicle-treated homozygous zQ175 mice when compared to WT mice and we found that CTEP normalized the level of p70S6K1 phosphorylation in homozygous zQ175 when compared to WT mice (Fig. 1b). 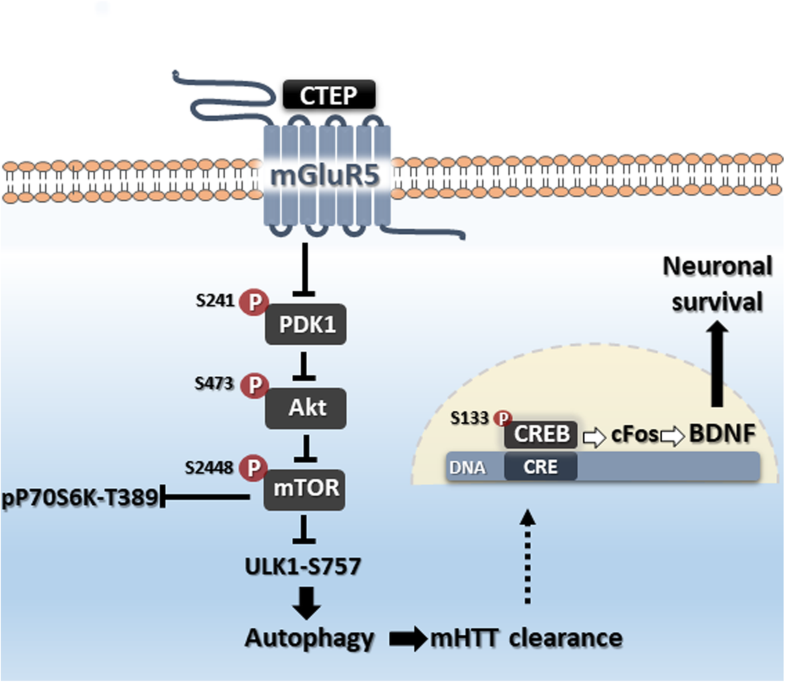 Taken together, these results indicated that chronic antagonism of mGluR5 with a selective NAM can correct the aberrant activation of mTOR pathway to trigger ULK1 activation and initiate autophagy. Autophagy plays a key role of in neuronal health by clearing cellular cargos and protein aggregates and defects in autophagy have been increasingly implicated in proteinopathies such as HD, Alzheimer’s and Parkinson’s disease [39–42]. This study extends our previous work using the mGluR5 NAM by identifying novel mGluR5-regulated signaling cascades that are required for ULK1 activation and autophagy initiation in zQ175 HD mice. 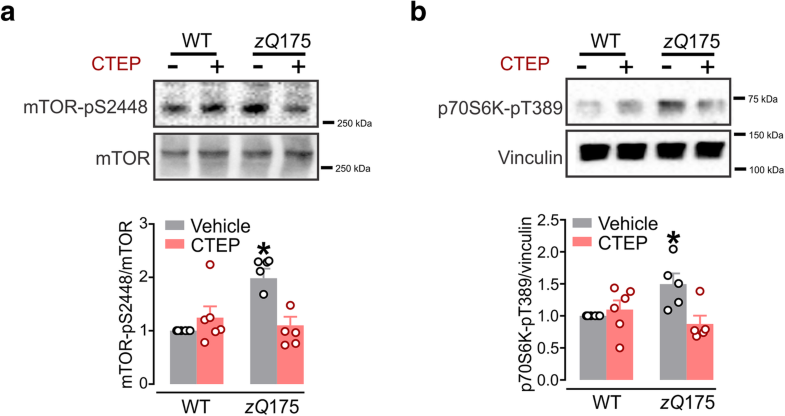 We have previously reported that pharmacological inhibition of mGluR5 improved motor and cognitive deficits in the zQ175 mouse model of HD due activation of both ZBTB16- and ULK1-dependent mechanisms of autophagy . The activation of the catalytic activity of ULK1 is due to a reduction in the inhibitory phosphorylation at S757 . Interestingly mTOR, a key regulator of autophagy, is known to phosphorylate ULK1 at S757 [37, 43, 44]. Here we provide direct experimental evidence that mGluR5 inhibition modulates PI3K/Akt/mTOR signaling resulting in ULK1 activation and the initiation of autophagy. Canonical mTOR signaling is initiated following receptor-dependent activation of PI3K to phosphorylate PDK1 at S241 . Active PDK1 directly activates Akt via phosphorylation that leads to the phosphorylation of mTOR at S2448 site [20, 26]. Thus, mTOR-pS2448 is considered a reliable indicator of the activation state of the PI3K pathway and mTOR complex [19–22]. 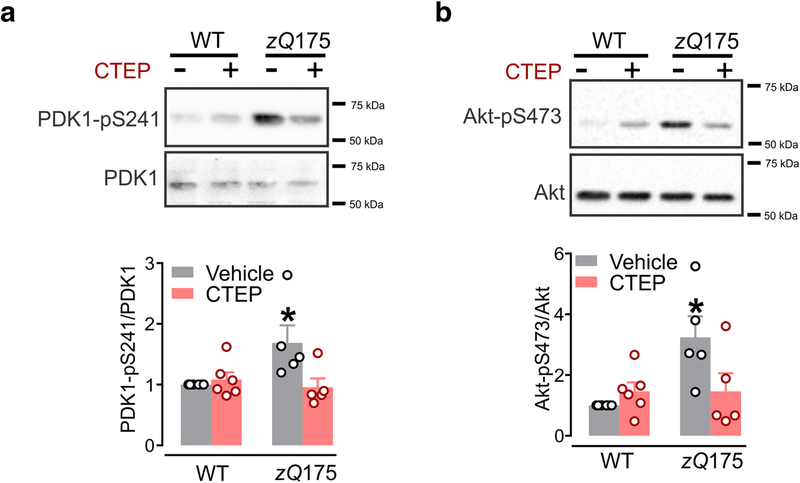 Here, we show that CTEP can normalize the levels of PDK1-pS241, Akt-pS473 and mTOR-pS2448 in zQ175 mice. We also detected a reduction of phosphorylation of P70S6K1 at pT389, a kinase responsible for many of the consequences of mTOR downstream signaling and is considered a hallmark of mTOR activity [20, 23, 24]. It is worth noting that the activation of the PI3K/Akt/mTOR signaling cascade has been previously reported following agonist-dependent stimulation of mGluR5 and was required for mGluR5-dependent long term depression in mouse hippocampus . Also, mHTT protein can bind and regulate different aspects of mGluR5 signaling [45, 46]. Thus, it is possible that in advanced HD stages mHTT enhances mGluR5 signaling via PI3K/Akt/mTOR pathway leading to autophagy inhibition and accumulation of mHTT aggregates that exacerbates HD pathology. mGluR5 initiates a variety of signaling pathways via the canonical Gαq-coupled mechanism and concomitantly regulates gene expression at both the translational and transcriptional level to support neuronal survival, differentiation and synaptic plasticity [7, 47]. Our focus in this report is CREB, since its activity was found to be modulated by both mGluR5 and huntingtin protein [34, 47]. Upon activation by phosphorylation, p-CREB binds to the cAMP response element (CRE) site within the gene and triggers target gene transcription including cFos [29, 30, 48–50]. cFos has been found to regulate BDNF expression in vivo that promotes the survival of and differentiation of neurons . Moreover, BDNF itself can induce cFos transcription in a feedforward cascade [52–55]. Interestingly, mHTT aggregates can sequester CBP and suppress CREB-mediated genes expression [33, 34]. In fact, suppression of CREB targeted genes is associated with early memory impairment memory in (Q7/Q111) HD mouse model . Here, we show that the previously-reported attenuation in apoptosis and rescue of NeuN-positive striatal neurons in CTEP-treated zQ175 mice  is accompanied by enhanced CREB phosphorylation and, expression of cFos and BDNF. It is worth noting that we did not detect a significant change in CREB phosphorylation of cFos expression in CTEP-treated control mice indicating a pivotal role of mHTT in regulating CREB/cFos pathway in HD mice. Thus, it is likely that the autophagic clearance of mHTT facilitates CREB-dependent gene expression and amplify BDNF synthesis that can support neuronal survival and reduce apoptosis. Further experiments are required to detect whether the origin of synthesized BDNF is neuronal or glial and to confirm that the autophagic clearance of mHTT is key in regulating BDNF expression by pharmacologically blocking autophagy and measuring BDNF levels in our HD mice.